I’ve always wanted to master the simple chicken-and-rice dish that almost every food culture has. Murgh pilau, Dajjaj wa ruz, Arroz con Pollo, etc. So, after years of watching my mom do it, plus a lot of self-reassuring and instructional phone calls from my mom, i finally decided to attempt it. Success! This was the most yummy one pot meal I’ve ever made. For the chicken, I used skinless chicken drumstick pieces. For the vegetables, I used eggplant, peas, and carrots. I guess this one was more Arab style then desi style because I put vegetables in it and toasted nuts on top. 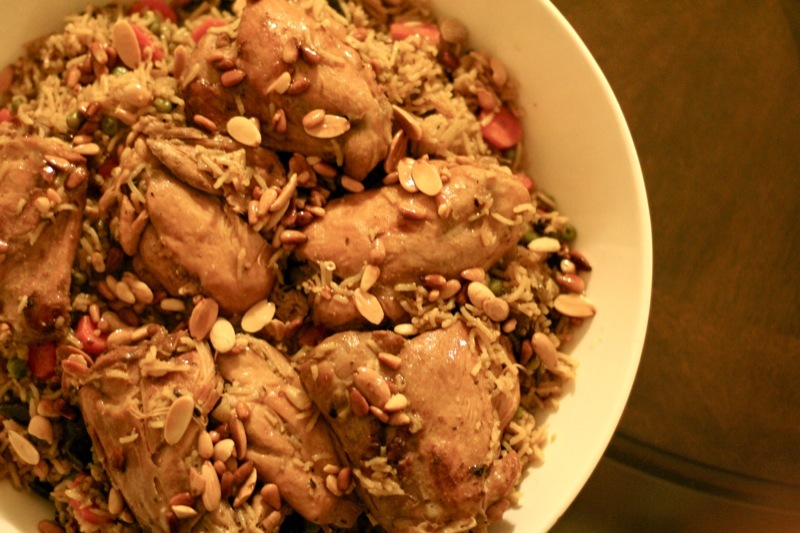 With some raisins and shredded carrots, it could be an Afghani murgh pilau. The possiblities are endless! Ingredients: these are all variables. You just need one of each thing. it’s about proportions. the directions will tell you how. 1. Chop and pan fry the eggplant until golden brown on the edges. Lightly sautee chopped carrots, if desired. 2. Chop and sautee onions and garlic in some olive oil; add some tomato paste if desired. 3. Rinse chicken and pat dry. Sprinkle very strongly with spice mixture and put, seasoned side down, into the hot onion/garlic pan to sear. No matter how many chicken pieces are being used, only sear the chicken in one layer. 4. While the chicken is searing, season the other side. Turn to brown both sides. 6. Add all the chicken to the liquid. Taste the stock and adjust spices and salt as needed. Bring the liquid to a boil, then let it simmer rapidly for 30 minutes. 7. Add washed rice, eggplant, diced carrots, and frozen peas to the pot. Stir well to distribute everything evenly. 8. Bring the pot to a boil. Let it boil until the liquid is almost dried out. Cover and lower the heat almost all the way down. Let it “steep” until the liquid is all dry. Serve with yogurt with mint and cucumbers. To serve Arab style: Lightly sautee/toast almonds and/or pine nuts in a pan with olive oil. Spread the rice in a large dish and top with chicken. When the nuts are golden brown and crunchy, pour the nuts and oil all over the top of the rice. For Kebsa, an Arab chicken with tomatoey-rice dish: No eggplants, but shredded carrots and/or chickpeas if desired. For the cooking liquid, mix one part tomato sauce with one part stock. Add chopped tomatoes before cooking the rice. Serve with a tomato-jalapeno-onion relish. Afghani Palau: brown the onions very well before adding the chicken. No eggplant, but shred the carrots and add raisins before boiling and steeping the rice. Arroz con Pollo: use sofrito (onions, garlic, green peppers) as a base for searing the chicken instead of just onions and garlic. Carrots and peas are the usual vegetables for this dish. For an Asian variation: Use white and green onions, garlic, and ginger as base to sear chicken. Season the chicken with soy sauce, allspice, garlic, ginger, black pepper. Add mushrooms, shredded cabbage, and shredded carrots before cooking the rice. didn’t read the post bc couldnt get past the yummy picture. adnan has gone to get dinner and i am starving. Also the arroz con pollo has tomato paste in it! That’s what makes it red-orange! And also honestly I have never seen a Puerto Rican use stock for arroz con pollo. Just water for us – we are simple people. use saffron, tomatoes, peas and… shrimp? marinate the chicken in oregano, garlic and red wine vinegar first. chicken and shrimp paellla! made with chicken stock too this is awesome. sooo gotta try your arab style one… yums! I love all the variations but, really, anything with eggplant in it and you totally own me. I will be OFFFICIALLY cooking this recipe for dinner this week.. Got the chicken, got the peas,,go the carrots and got the eggplants..oh my 🙂 looks great! Thanks Taiyyaba! This is so helpful, Asad is going to be eternally grateful to you for finally inspiring me to cook something!!! !